Home / Acne Serum Reviews / Bionura Retinol Serum Review- Do The Ingredients Cause Side Effects? The Bionura Retinol Serum is formulated for reducing fine lines and wrinkles, restoring skin elasticity, and minimizing pore size. Does this serum really function as described and are there any side effects? 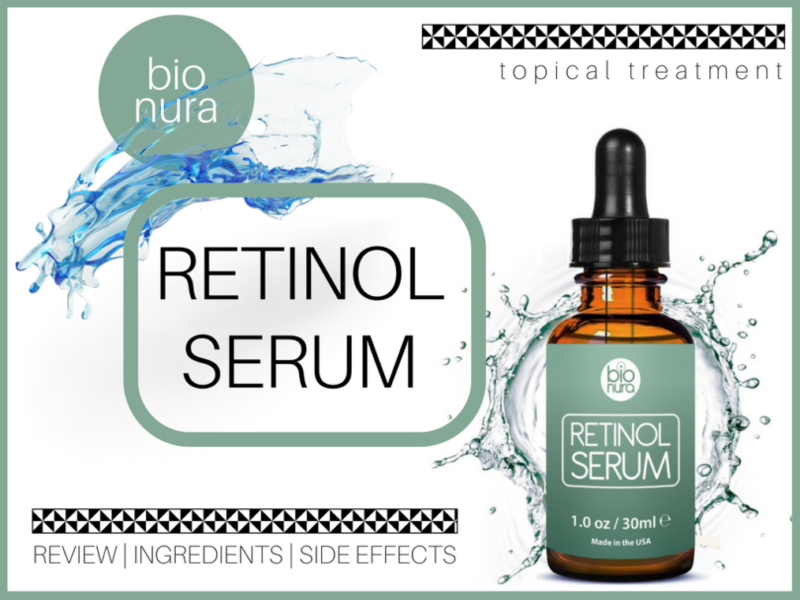 What are the Bionura Retinol Serum Ingredients? Conclusion: Is it the Best Retinol Serum? We wanted to read some of the Bionura Retinol Reviews on Amazon UK to see whether or not people were experiencing side effects from the ingredients. Does Bionura Retinol Serum help wrinkles, unclog pores, and even out skin tone? Customers on Amazon.co.uk are questioning the strength of the Retinol as they did not see any results after 6 weeks of use. Retinol is also known to provide a slight tingling sensation on the skin and one Bionura Retinol Serum review said that they did not experience that sensation at all. Customers have also said that the consistency is not viscous or serum-like and is actually more of a watery consistency. Even though there are critical Bionura reviews there are people who like the product and have noticed improvements in their clogged pores, rosacea, and overall complexion. Estrohalt helps lower estrogen side effects and may help skin complexion. I fell in love with the serum as my skin does look better- cleared itself out and I will be ordering along with the moisturising cream from the same series. Friend recommended me to get serum with vitamin A and C, where this is the only one I came across that has both of vitamins together and doesn’t dry my skin. I must say that this serum has brightened the look of my complexion. My skin looks plumper & fresh, but perhaps it would take more than one bottle for improvement where wrinkles are concerned. Perhaps the results would be more positive if applied on younger skin when fine wrinkles start to appear. I will not re-purchase. 2.5 % Retinol - Is a form of Vitamin A which is beneficial to the skin in that it improves cell turnover, helps the skin heal faster, and removes dead skin from clogged pores. Vitamin C - V﻿﻿﻿﻿itamin C is a potent antioxidant that's beneficial for our skin since it helps skin elasticity and lightens dark age spots. A strong immune system is crucial for clear skin and Vitamin C is an established immune boosting vitamin. It can also help stimulate collagen production. Vegan Hyaluronic Acid - Hyaluronic Acid has advantages for anti-aging, increasing collagen, moisturizing, and providing flexibility in the skin. Green Tea - Green tea contains a powerful antioxidant in EGCG (epigallocatechin-3-gallate) which might decrease inflammation and premature signs of aging. Vitamin E - Vitamin E is a well known ingredient in many skin care products since it assists skin elasticity and provides moisture. It may also reduce pimples since it's antioxidant properties lower inflammation and heals damaged skin. Jojoba Oil - It has moisturizing properties that will allow your skin from getting dry. Jojoba may lessen the appearance of acne scars, as it's been proven to stimulate collagen production (1). Collagen can help skin cells retain their strength and makes skin smoother. Other ingredients that are listed on the back of the box like Ethylhexylglycerin are fillers and skin conditioning agents that are not all natural and may have side effects such as allergic reactions. Alcohol is also added into this product which dries out the skin and may have an opposite effect to what the consumer was hoping for. This is another product manufactured by Bionura which includes various of the same ingredients as the Retinol serum such as Jojoba oil and Hyaluronic Acid. We have not done a Bionura Vitamin C serum review on this site, but there seems to be some good reviews on Amazon UK. Bionura is formulated to increase moisture in the skin, minimize pores and wrinkles, restore skin elasticity, and even skin tone. Serums help to smoothen out fine lines and wrinkles and provide moisture to the skin. They're more concentrated than regular creams so they penetrate deeper into the skin producing a greater impact. They're lightweight and you don't have to use as much as you do with thicker moisturizers and retinol creams. Apply a small amount to hands and disperse over face and neck. It may be used under makeup. It's important to "patch test" to make certain you don't experience irritation before full use. You can use it twice per day, but it's suggested to work your way up to this dose. We hope this Bionura Retinol review has informed you about how it works, the ingredients, and possible side effects. Some of the ingredients have antioxidant properties that are important for overall skin health, but we can't be sure of the real potency of every ingredient. This product works for many people in the UK and we rate it higher than other serums we have reviewed like PurOrganica Retinol Serum because we are not sure if all of their reviews online are authentic.